F.L.O.W. is a free mobile lending library of donated books, founded in July 2014. Our mission is to celebrate and promote feminist works, and move them among communities to center marginalized voices and experiences. 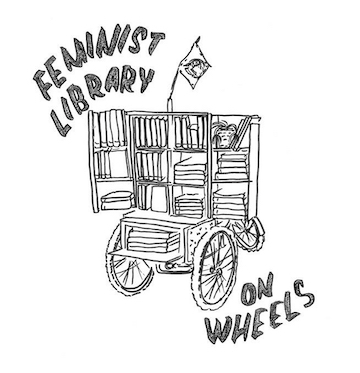 The Feminist Library On Wheels (F.L.O.W.) is a node of the Women’s Center for Creative Work (WCCW) founded by members Jenn Witte and Dawn Finley, both lifelong bookworms and devoted cyclists. Our multimedia collection of feminist books, artifacts, and ephemera is made available to as wide an audience in Los Angeles as possible, by bicycle. We promote a feminist approach in three ways: through the riders who participate, the personality of the items donated to the library, and the use of bicycles. Our collection is searchable online, and available both at regularly scheduled locations as well as at special events (CicLAVia, farmers’ markets, fairs and parades, etc). Anyone can sign up for a free library card, check out as many books as they want on the honor system, and either return them to a designated drop-off spot (including the WCCW), or bring them back to us when we’re out and about.